While safety risk factors vary based on injury and occupation, there are a number of safety rules that apply to virtually all workplaces. 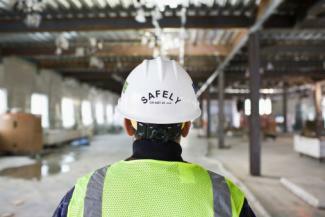 These basic safety guidelines are an important foundation for any comprehensive workplace safety plan. Keep floors dry - Immediately take steps to dry water or other liquids that may gather on floor areas due to weather, spills, leaks, or other causes. Properly mark wet floors - In situations where it's not possible to dry wet floors immediately, clearly mark with appropriate signage. Avoid wet floors - Do not walk on flooring areas that are not dry. 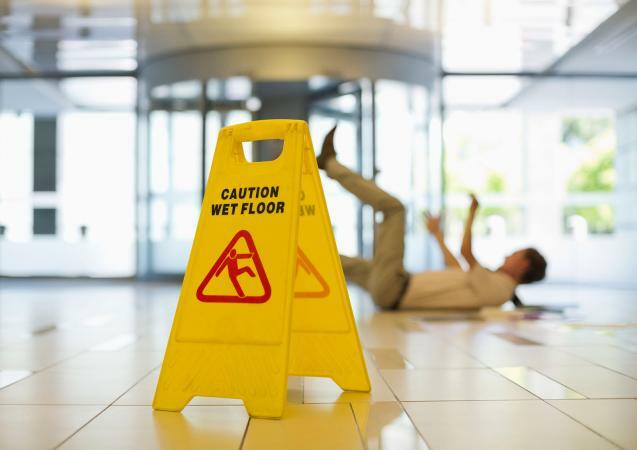 Fall injuries are not always caused by slipping on a wet surface. Trip hazards resulting from clutter in walkways or poor positioning of furniture and equipment in inappropriate areas are responsible for many workplace falls and other injuries, such as broken toes, sprained ankles, etc. Eliminate clutter - Keep walkways and stairs tidy and clear. Make sure they stay free from clutter and other trip hazards, such as power cords, file boxes, etc. Keep drawers closed - Keep desk and filing cabinets drawers closed at all times they are not being used. Careful furniture & equipment positioning - Situate furniture, office equipment and other workplace items to avoid interrupting the natural flow of traffic in the workplace. Pick things up - If you see items in the floor that pose a risk, pick them up and move them - even if you are not the person who placed them there. Use furniture for intended purposes only - Chairs, desks and other workplace furnishings aren't meant to function as ladders. Using them in this way can be a quick path to a serious injury. Use proper equipment - When you need to reach something overhead, properly use a step ladder or stool designed for climbing to access the item(s). No matter what type of environment you work in, keeping your hands clean is critical to workplace health and safety. As the Centers for Disease Control (CDC) points out, proper hand hygiene is critical "to avoid getting sick and spreading germs to others." Of course, there are other workplace-specific circumstances that apply. For example, those who work in a daycare center should wash their hands after changing a diaper. Those who work around animals should was their hands after coming into contact with an animal or animal waste. According to the CDC, they way you wash your hands is just as important as when you do so. You can't just run them under the faucet for a few seconds and shake them. To promote health and safety in the workplace, you need to follow proper hand-washing techniques. Mitigate ergonomic risk factors - Recognize risk factors in your work environment related to ergonomic safety and take steps to reduce the potential for related injuries. According to Spine-health.com, "Back pain is one of the most common work-related injuries." Arbill points out proper posture can be critical to preventing work-related back pain and injuries. Whether you spend most of your work time sitting, standing, walking, bending, or in any other position, proper posture is essential. Proper positioning - Follow best practice recommendations for good posture in various positions, such as those recommended by Mayo Clinic and Cleveland Clinic. Posture exercises - Set aside a few minutes to do posture exercises a few times each week to improve your body positioning and protect your spine against injury. According to the Office of Compliance, Safety and Health, "Improper use of easily overloaded, unapproved extension cords can present a serious fire safety hazard in the workplace." With that in mind, it is important for employees to make sure that their use of extension cords in the workplace is limited to safe, intended applications. Limit usage - Don't substitute extension cords for permanent wiring or use extension cords beyond their rated capabilities, even temporarily. Don't daisy chain - Avoid linking together multiple extension cords to power a device, an unsafe (and all-too-common) practice known as creating a daisy-chain. It's not unusual for companies to have workplace rules that prohibit cooking of any type in offices or other work areas. As Fireline points out, "Hot plates and burners used within an office area could lead to a workplace fire." While employees often like to heat food brought from home to eat at work, there are safer options than cooking in areas where work is performed. Limit cooking to designated areas - If you want to allow employees to cook in the workplace, set aside the break room (or another area) as a designated location where this activity is permissible. Provide quality equipment for cooking - Ensure that equipment employees can use for cooking in designated areas is of sufficient quality to allow for safe operation, as recommended buy Almea Insurance, Inc. Require management approval - Require employees to get approval from management before bringing in a space heater to use in the workplace. Publish specific requirements - Require approved units to meet specific guidelines, including being free from damage and rated by Underwriters Laboratory (UL) or similar. Proper placement - Make sure that employees keep at least 3 feet of open space surrounding approved heaters, verify they are not being used near combustible or flammable substances, and make sure they are not left unattended. Evaluating usage - Continually monitor employees to verify they are using the correct safety gear and equipment, and that the items they are using fit properly. Provide training - Make sure employees maintain top-of-mind awareness regarding safety gear requirements - including what they should use and why they should use it. Recognize compliance - Provide recognition for employees who consistently wear their personal protective equipment, both to reinforce their positive behavior and to encourage others. The workplace is no place for playing pranks. As Safety Partners, Ltd. points out, "Horseplay and practical jokes in the workplace, especially around machinery, can be extremely dangerous." According to Executive HR Consulting Group (ECG) "Every year hundreds of injuries are reported in the United States alone due to pranks pulled at work." The firm recommends companies adopt formal policies prohibiting such behavior. Emphasize risks - Remind employees pranks can easily get out of hand and lead to serious injuries for which they, and the company, can be held liable. Provide positive alternatives - Implement steps to ensure that your work environment is both fun and safe, while also being productive, such as effective team building activities. Chances are that your company's safety policy specifically states employees who experience an accident or suffer an injury in the course of business should report the occurrence to his or her supervisor or the company's safety officer right away. This is an important safety rule that you should always follow, as it serves to protect you and the company, and can also help prevent someone else from getting hurt. Follow company policy - Don't talk yourself out of reporting an accident or injury per your company's policy because you think it may bee too minor to bother. The company needs to know for a variety of reasons, including Occupational Safety and Health Act (OSHA) compliance. Protect your rights - Immediate reporting of work-related accidents and injuries protects your worker's compensation rights should the situation worsen, while failure to report within a reasonable timeframe could prevent you from being eligible for this type of coverage. Of course, these are only a few of a seemingly endless list of possible workplace safety rules. The options provided here are general points of workplace safety applicable in most workplaces. When coming up with a comprehensive list of safety rules for your organization, you'll need to consider the nature of our company and industry, as well as the composition of your workforce and your organization's policies and procedures. Help keep employees focused on staying safe by incorporating safety topics in your newsletter and adopting memorable workplace safety slogans.